Our clients love our Digital Calligraphy Service for Envelope Calligraphy. Be it our Brides, Grooms, Wedding or Event Planners or Corporate Companies they all love our Digital Calligraphy service addressing their envelopes. It’s also nice to have matching place cards for the event. So I do tons of Calligraphy printing for place cards for elegant events. I serve San Francisco and surrounding cities including Napa, Sonoma County, Oakland, San Jose. I also work via email and virtually with clients from Southern California including Santa Barbara, San Diego, Beverly Hills and nationwide with clients form Seattle Washington, Washington, D.C., Texas, Florida, New York City and Hawaii. 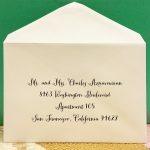 The Above Envelope Calligraphy and matching place card is in Shelly Medium Font Style by Hyegraph Invitations & Calligraphy. Please see our Calligraphy & Envelope Addressing Pages for more font styles and examples of calligraphy. You can order Hyegraph’s Digital calligraphy for $1.00 per envelope and $1.50 for place cards. For colored ink the price is $1.25/per envelope and white ink calligraphy is $1.50/per envelope. I can have your addressed envelopes or place card calligraphy ready for you in 1 to 2 business days. 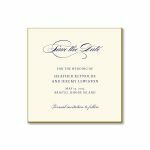 Simply email me the guest list, and send or drop off your envelopes or place cards to our store. 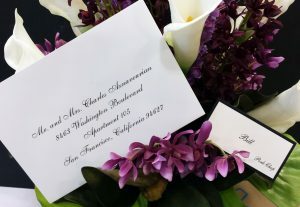 You can choose Hyegraph Place Cards and Invitations or bring in your own invitations and/or place cards to be printed on. Hyegraph also provides, in addition to envelope printing, stuffing, sealing, stamping and mailing invitations/wedding invitations. Please see our Calligraphy Page for Stuffing, Sealing, Stamping, mailing options. It costs $.75 per envelope set. Please see our Testimonials Page for Happy Customers! Thank You for considering Hyegraph to be part of your Envelope & Place Card design process.